15:00 – I hurt myself opening a Coca Cola can! Anyway, talking about Kevin Tan and his podcasting ambitions (ie: he might be starting one too! 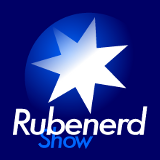 ), the Official Rubenerd Show Reviewer (ie: Laura Douglass! ), woes with microphones (ie: painful feedback issues), a book review (ie: The Last Juror by John Grisham), an update on my mums condition (ie: not sure), and being injured by a Coca Cola can. Oh and an update on the Episode Archives page. And being injured by a Coca Cola can.